Finally... How to train for the NFL Combine revealed! Last February I was in Indianapolis, Indiana seeing the fruits of my labor perform at the biggest testing stage in footballThe NFL Combine. Over dinner with a colleague who is a sports agent, he expressed that there is a need for a concise training protocol for the NFL Combine. He knew I had authored The Pro Combine Preparation Manual that teaches the detailed technique instruction for the combine tests, but suggested a need for a complete training program that encompassed the training aspect. Well, the Secrets of Combine Training is a complete eight week four phase program designed to achieve peak performance at football combines. It is a complete resource, that covers everything from athletes need to reach their physical performance. One of the best ways to produce results in combine training is to determine what the athlete needs to work on. In this comprehensive manual you will get my method of analyzing an athlete's testing results, and developing a training prescription based on a mock combine. You will learn my thought process and how I prioritize training prescriptions based on testing results. Do you know what your limitations are? Do you know how to identify them? Do you know how to correct them through training? There's a lot more to the Secrets of Combine Training. Do you know how to PEAK on combine day? Peaking on Combine Day is the ultimate goal. It is what you want, why you have trained so hard and prepared so long for. How do you do this? In Secrets Of Combine Training you will receive my 5 Day Pre Combine Peaking Plan. This five day training plan will allow the body to recover and be firing at your highest level on testing day. It is a detailed day by day, detail by detail breakdown of what you should be doing. No more guesswork. No more doubts. Train, Prepare, Peak and Perform! This resource makes it that simple. Do you train hard? Do you train smart? Do you know that the drills and exercises you are perfoming are correct? The Secrets Of Combine Training provides you with a 8 week training plan including our 5 day Peaking Plan. Every day you are given a workout or two to perform. Wow two workouts a day? Well to be your best, you have to give something to get something. My NFL Combine athletes train 2-3 times per day. The run, cut, catch, lift, stretch, massage, watch, learn, listen all to perform at your highest level at the combine. It takes dedication to achieve your goals. Combine are the ultimate test of your preparation. You need to train to perform. You need to learn to perform. The ultimate test is not easy, The Secrets Of Combine Training will be the textbook for you to train from. "Mike ability to assess, prescribe, and produce results in a short period of time is amazing. 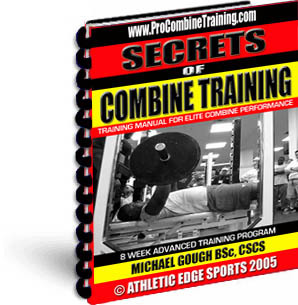 His Secrets of Combine Training will no doubt get the performance results you are looking for." "When it comes to clear, concise, combine performance program that you can do on your own and produces results that are astonishing, it is a book you must have." "Your expertise, knowledge and program design when it comes to combine performance is second to none!" At this point I'm sure you're asking the logical question: How much? Well, when so many of my clients have achieved such great success from my Combine Training Program, (many of them have tested at the NFL Combine) I asked them how much they thought I should charge. And do you know what they said? They said $1,000.00, minimum. Naturally, they felt this way because they know that my training methods work, and they know that if the athlete pushes himself through the training system the rewards will be worth the price paid bot in effort and money. You, on the other hand, probably can't even imagine how powerful this training program is. You may tend to doubt what I have written. You may think it's all a bunch of hype. What I have described to you here is a program that if you give your all, commit youself, push yourself you will get amazing results in your combine performance. In fact, I'm so sure of it that I'm willing to let you in on this program at a special introductory amount. Instead of asking you to part with a thousand bucks, as my clients suggested, I'm only going to ask for a fraction of that amount. So here is the scoop: Over the next day or two, those who take a step forward and order the Secrets Of Combine Training will get it for the incredibly low amount of $197.97 plus $5 S&H in the U.S .
Now, I realize that some of you may be thinking, "$197 for a training program? That's outrageous." And to those who say this I reply: "Okay, you fly to Florida, train with me for a week, pay me for my knowledge and expertise, ask me to design a training program for your return home, then ask me to consult with you on a weekly basis. Then total up your expenditures and you'll be looking at an upfront cost of upward of 5+ thousand dollars. Not to mention your time. Now let me get even more to the point: The Secrets Of Combine Training is the ONLY training system I have EVER seen that is specifically designed to enhance your combine performance, taking into account every aspect of training and preparation. Suppose you run a 4.3 sec 40, jump 40+ inch vertical jump, rep 30+ reps on the bench press. Wouldn't that be worth it to you? And suppose you earn yourself a fat contract in the NFL, or secure a scholarship worth over six figures at a premier college. Isn't that worth it? Do you really want to be like all the other athlete out there that attend these combines? Or do you want to be different? Better? Or the BEST? I certainly hope you want to distinguish yourself from your competition. Afterall, the alternative is unthinkable. Order NOW, put forth the effort and success will follow. P.S. You will not want to wait to get this manual as the sooner you get it, you will be on the fast track to a combine performance of your life. Order NOW!